It’s important to address this problem, as it affects the safety of your home, the value of your home and your peace of mind. Q: We just learned our foundation is failing. What the heck do we do? A: Your home is one of your largest investments, so it’s important to have a stable foundation. Over time, a home’s foundation may begin to crack, sink and settle. Have you noticed a gap forming between a wall and the floor or ceiling? 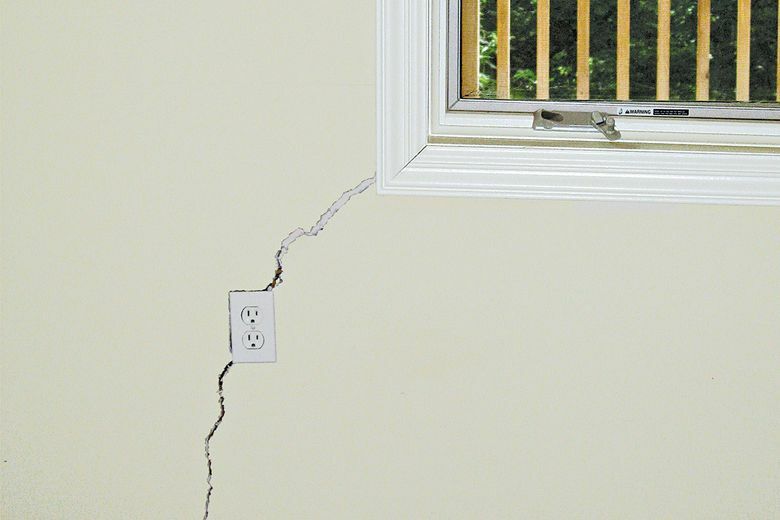 Do you see cracks in your drywall near windows or door frames? How about cracks in the brick or exterior? Do you notice some of your first-level floors sloping or sagging? These are all signs that your home’s foundation needs professional attention. Foundation problems never get better, only worse. Therefore, it’s important to address these issues sooner rather than later, as they affect three important parts of your life: the safety of your home, the value of your home and your peace of mind. With our wet Northwest winters, soil erosion is common. The layers of soil your home rests on are greatly affected by these changes in moisture. The soil under concrete slabs becomes saturated and soft or washes out completely. There are many signs that indicate your home is experiencing a foundation-settlement issue. These include stair-step cracking, separating chimneys, problem doors and windows, foundation wall cracks and drywall cracks. Steel push piers. These push piers can lift your home back to level, closing cracks and improving the operation of doors and windows. This option does not require the use of heavy equipment and piers will not rust. And as a below-grade solution, piers are concealed from sight. Helical piers. These are suitable for both light and heavy loads and are able to reach greater depths than other options. Many homeowners choose helical piers to stabilize a lighter structure that has settled, such as a deck or stoop. SmartJacks. SmartJacks are steel support systems used to permanently stabilize and level the girders and floor joists in a crawl space. They do not replace the existing columns and piers, but add strength and stability to what is there. Installation is quick and can be done year-round. Carbon fiber straps. Carbon fiber is a material with very high tensile strength, making it a great solution for reinforcing basement walls. This two-part epoxy adhesive ensures an extremely strong bond to the wall. Stress testing has shown that before the strap would peel away from the wall, the shell of the concrete block would actually break apart. Powerbrace. This system is another wall option designed to support basement walls, and allows for strengthening over time. A Powerbrace utilizes a joist-reinforcement method that distributes the load evenly and eliminates the worry of damage caused to wood floor joists commonly seen with other I-beam systems. Wall anchors. Wall anchors are a versatile repair method because they can be used to stabilize a variety of problems such as bowing walls, walls tipping in at the top and walls pushing in at the bottom. They are installed independently of the floor system of your home and can be installed around obstacles such as pipes, vanities, sinks and toilets. The damage caused by an unstable, shifting foundation is not something any homeowner enjoys, but by identifying and addressing the problems earlier rather than later, you can save money and protect against further damage. Jim Wiederaenders is a senior design technician at Matvey Foundation Repair and a member of the Master Builders Association of King and Snohomish Counties (MBAKS). If you have a home improvement, remodeling or residential homebuilding question you’d like answered by one of the MBAKS’s nearly 3,000 members, write to homework@mbaks.com.